Online artist hub is one of the Best Artist Management Companies in Delhi NCR, where management skills marry the professional skills of artists from around the world so as to provide you an unforgettable experience. We bring the ease of Bollywood Artist booking in India on your fingertips by the eliminating middle-men i.e. convenience at the affordable range. Whether you need a dance troupe, a rapper,a singer to dance the night away to a host, or a comedian to lighten up your mood all day long- We are available 24 hours at your service. We understand the needs of each client varies, therefore our team is equipped with impeccable skills which can help you in making the best decision for your corporate event, wedding, birthday, ticketed shows, BhajanSandhya and so on. We are the leading Bollywood artist management agency in Delhi, India, but not limited to it as we strive to fulfill the request of those clients also who need international artists right in front of their eyes. If you require something in the middle of Bollywood and international talent; then have a go at gazall. Or if you want to top the charts, then you should definitely get in touch with us for the biggest names in Bollywood. 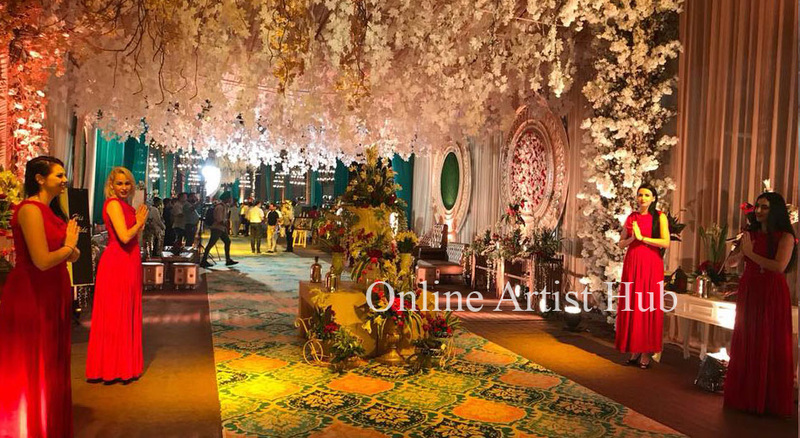 Unlike other Artist Agency in Delhi NCR, we assure you timely execution from artist and our side at all levels, so that youfeel like heaven is under your feet on that special day. If you Wish to know more about how can we make your special occasion extra special or you already have whom do you want to see live on your mind; then we arejust one call way. Don’t wait because we can make it great! Online artist hub, a leading Artist Management Company in Delhi, inaugurated in 2004 is an epitome of excellence and perfection. The company’s portfolio of artist is available all the time for you which include singers, dancers, actors, sports personalities, hosts, comedians to name a few. Being the top artist management company in Delhi NCR, we provide top-notch services that are tailor made according to clients’ needs. Whatever your upcoming occasion maybe, right from corporate event, weddings, Stage shows, Parties,conference to Bhajan Sandhya- we can provide you artists for all the events without too much of involvement from your side. Success for our company is derived from the passion, enthusiasm and management skills of each person in the team which results in an awesome event every time. Our commitment towards high quality services fuel the trust and long term relationship between our clients, which justifies the fact that more than 50% of our clients are repeated ones. We keep a warm relationship not just with the big celebrities, but also with independent artists who put their heart and soul in making your event Huge! As a result, now we have artists from around the world including Bollywood in our catalog. The online Artist Hub is not just a company, but an easy online platform for artist booking India which means you don’t have to waste your time talking to several middle-men when one call is the solution to all the hassle. So, what are you waiting for, call the best artist booking agency in India now for celebrating the wonderful evening with your friends and family.